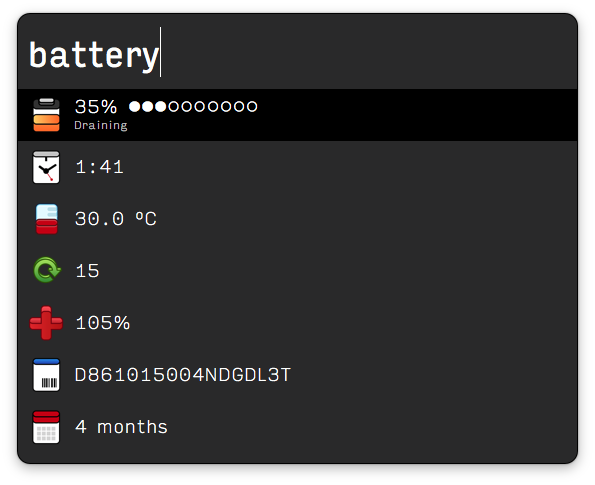 Usage: enter the keyword "battery"
I love the icons too. Just perfect! Another App made obsolete. WOW. Really great and helpful. thx a lot. Awesome! Allows me to remove the battery icon from menu bar. On 13" MBP, menu bar space is precious. I'm particular about my menu bar as well. Have you checked out Bartender to keep it tidy? This is great. And I'll second GamerChase on Bartender. It's a must have. Thanks man, I can delete a Dashboard Widget now Doing this via Alfred is so much cooler. Hi, I've added your workflow to the [Alfred Workflow List Website] to share with more users. Hope you like it. Great initiative for sharing/discovering workflows :-) I added a couple more of my workflows in there. This works more smoothly than the extension I was using in V1, thanks! A little update after a long time - added temperature reading, serial number and battery age. Did some work updating the icons too. Very nice -- I've ditched another menu bar item. Thanks! I can't seem to get this workflow running. It hangs at "..., retrieving..."
Hi there, if possible could you run the following command in Terminal and PM me the output? This looks great and, assuming it's still running, I'm definitely going to install it. I have a question: is it at all possible to tap into the "Apps using the most energy/battery" and display the top two with this workflow, too? That's really the only use the menu bar battery icon still has for me, personally. I know you can also more or less just use the activity monitor for such a thing, but I thought it worth asking. Great workflow! Keep the awesome up! Question: what theme is being used in that image? Seems to still be working for me. I've had that happen a lot with other workflows, though. Eventually I learned to open the Workflows preferences, select the workflow in question, and click the spider icon on the top right to enable debug output (and changing the dropdown in the console to "All Information"). Then I trigger alfred, type the workflow keyword, and see what information it outputs in that console area. Helps me see if the workflow is bugging or even being triggered at all. Opening Google search is just the "fallback" search, which means that the workflow failed to produce any usable results for Alfred. So, probably some Yosemite upgrade changed a version of Bash, and that version of Bash chokes when the degree symbol is next to a variable.